Makeup and Rainout Dates. In the event of inclement weather, please check the club website for cancellations and updated schedules. Registration for the fall is required to participate in the evaluations. Make sure to attend evaluations for the appropriate age group. The age group chart is on page 2. You must bring a small passport size photo to the tryouts. If your child is new to travel, you must also bring a birth certificate. 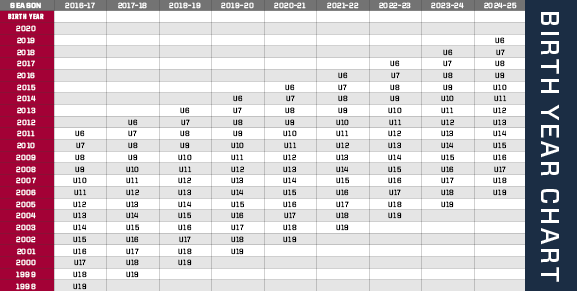 Although players are evaluated independently by the club coaches throughout their individual team’s seasons, all players intending to participate in the upcoming fall season are required to participate in the evaluations. If a player cannot play in the fall but wants to in the spring they still MUST come to evaluations. This evaluation process allows independent evaluators to assess all players at the same time and therefore provide better overall talent assessment. This also allows us to determine how many teams we need to create and at what levels. This is critical for the U9 age group as this will be the first time the entire group can be assessed. It is the club’s intention to field a competitive team (s) in all age groups where possible based on skill. In some cases, the club will combine age groups as necessary to field teams. These teams will be placed in the highest competitive league bracket available. Our travel program is successful because of the many volunteers who make it possible for our kids to enjoy the game. As always we encourage people interested in helping to achieve this objective to continue to do so and we welcome new coaches and volunteers. If you are interested in volunteering your services in any way please contact any of the SCNM board members.